Do you want them autographed? August 2015 Hillary Clinton was asked, "Did you wipe your email server?" and she evasively replied, "Like with a cloth or something?" A year later we found out that "cloth" was BleachBit, a software application that deletes information "so even God can't read it," as Congressman Trey Gowdy announced August 2016. After you have smashed your BlackBerry, don't forget to wipe the fingerprints from your email server with this non-abrasive, soft microfiber Cloth or Something. Thin, foldable size makes it easy to stash the Cloth or Something in burn bags. 6" x 6" size quickly wipes even the biggest email servers with thousands of emails. Optionally autographed on the back by Andrew, creator of BleachBit. Guaranteed not to prove intent, or you will get a full refund paid when you are released from prison. USPS first-class shipping and handling is a flat rate of $2 per order. Yes, this cloth is real, and you can really buy it. Frame it as a collectible or clean smudges from your eyeglasses, jewelry, smartphones, and tablets. Buy an extra cloth for your VIP (VERY VIP) client. Andrew has appeared on interviews with Fox Business News, the Sean Hannity radio show, and others. Cloth or Something has been mentioned on the Fox News TV channel, FoxNews.com, Charles Tendell show, and many others. Don't wait for a subpoena: Order Now! See terms and conditions about payment methods, refund policies, and more. For customer service email cloth@bleachbit.org. They arrived last week. They're awesome. Not only do they work well, I am continually amused by them. I've been giving out the extras to others, who have also enjoyed them. Thanks for this, and more importantly, thanks for BleachBit! ---Brian W.
I like micro fiber cloths or something for my server and computer - they pick up dust better and don't scratch my emails. Get some autographed by Ed Henry and you got a collectors edition. Great purchase! I would also recommend buying the shovel-or-whatever for burying those unsightly closet skeletons. I'm wiping my hard drive to get rid of some uh,... Images - but do I really have to do it 32 times? The cloth or something is getting sweaty and my elbow is getting sore. This is hard work! I'm sorry, I cant be of help because I don't remember. Honey, I think its about time for your mid-morning nap. The cloth-or-something is my favorite go to. But I was using it as I was eating a bowl of orange sherbet. I really love orange sherbet and eat very aggressive. So in a complete daze from my sherbet ecstacy I wiped my mouth with it. Now I can't remember ages 12-28 and I lose all control of my bowels during the jeopardy theme song. I would like to view your other products to purchase other than solely having to rely on links from reddit. I must order these to to clean up after my gangland activities. Oh thank you BleachBit!!!!!!! I can only give two stars to the cloth-or-something. It worked as advertised but it didn't clean my weiner. Now i can finally send these totally 'non-confidential' Email's and smash my devices to pieces without ever showing any intent! Thank you Cloth or something! Giving away secre...Err i mean 'informations' has never been easier! Nobody told me I had to use the Cloth or something and that I'd better have been damn sure to have Weiner's thing wiped down. And now, the FBI has 650,00 of my emails that nobody was ever supposed to see. WTF was this guy trying to pull?! BleachBit should've known that Weiners just aren't my thing. Sure, I've been married for many years, but it was really a marriage of convenience. I mean, it gave me a more bankable name (no pun intended). Rodham? Really? No way. I've EARNED this Presidency. I'm ENTITLED to it, the people OWE it to me. I'm not really excited about Weiners, but in fairness to Weiner, he and I have this insatiable lust/need for young (or old, at least as far as my preference is concerned) skanky, AIDS infested women. Genital herpes are always a PLUS since I feel especially comfortable being around my own kind. Just a quick swipe of the Cloth or something, and she's good to go again! Thank you Cloth or something! I am shocked that this product is still available. It should have been recalled long ago. Time to repeal the Lawful Commerce in Cleaning Products Act. The danger was first recognized months ago when an elderly grandmother used the cloth to wipe the sweat off her brow while doing her normal dusting chores. The high powered, fully automatic cloth misfired and erased most memories of her tenure as Secretary of State. I wish that I had used a Cloth or something." Cloth or something probably would have given me 400, 450 Electoral Votes. Maybe even 500+ if I had used Cloth [AND] something. Oh well, a win's a win. At least those Baskets of Deplorables will be crying their eyes out as we shoot off Million$ of dollars of fireworks over the Hudson. Let's break that glass ceiling! I'm Love'n My "Cloth or Something"
I received my official, autographed, "Cloth or Something" microfibers today; and I must say, they have exceeded my expectations! These are destined to be collector items, IMHO. Every time I look at them I chuckle and shake my head - lolz. THANKS SO MUCH ANDREW! I've been a BleachBit user for many years. I use BleachBit to keep my OS clean of junk. I'm happy for you Andrew! Thank you again and "Keep on keeping on!" Hello. I'm in Canada. I just ordered some of these cloths today for Christmas presents. I was wondering if anyone can point me to a link for a tracking number or give me a rough idea how long it took to get their cloths. Thank You very much in advance. Dave Smith: They will be sent via USPS first-class mail from the USA. According to stamps.com, this rate of postage takes 7-21 days for delivery to Canada. I will send them next week, so they should arrive before Christmas. As another frame of reference, I sent some to Taiwan on October 16, and by November 1 someone send me a selfie with the Cloth or Something. That was 16 days for a longer trip. Hey Andrew. Thank you for the info & getting back to me so fast, I really appreciate your time. Have a great weekend. Just curious, but are these tax deductible? If not, maybe you could make them so. Like a donation thing or something. Maybe even more people would be willing to buy them then. Just a idea. Moderator for BleachBit and a maintainer for Winapp2. Windows 10 x64 (switching to ReactOS in the future). 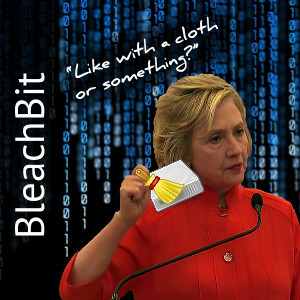 I have thought about forming a 501(c)(3) charitable organization for BleachBit. It has some administrative costs that may include incorporation, tax returns, board meetings, etc. If I did, the tax deductible portion would be the purchase price of the cloth minus the retail value. For example: retail value $3, customer pays $5, so tax deduction is $2. By the way, I recently posted a new job for contractors to update the build system. Andrew, I ordered on 11/13/2016 and have not received them. When will they ship? I placed a 2nd order on black Friday and am curious when they will ship also. jcfaber1: Thank you for your patience. Last night I just got a shipment of cloths from my supplier. We worked on them last night, and I mailed some orders this morning and plan to get the rest out this week. I will send you an email when each ships. Thanks for your response. I am eagerly waiting their arrival. I have a company Xmas party on 12/13. If I order several autographed cloths this evening, will I receive (Ohio) the cloths by next Monday (12/12) in time for the party ? The product is in stock right now. That's good news. I mail by USPS first class mail which usually takes three days.This is probably enough time, but USPS does not guarantee a delivery date on first class.. After you place your order, email me at cloth@bleachbit.org and I will make sure your order gets shipped ASAP. I am glad to ship using a different service or carrier for an additional charge, if you wish. If you are interested in special shipping, email cloth@bleachbit.org . Hi, I ordered too many of these cloths. How do I return them? To return please mail them back to the return address on the envelope. If you do not still have that, email cloth@bleachbit.org for the return address. Please include the contact information from the original order, so I know where to send it. The cloth-or-something is the phrase that I use so often now. It's my favorite sentence ever said by Hillary. Can I order it with the changes I wonder? That would be nice to have one with a signature of Hillary. Do you also have matching hammers for those pesky Blackberry phones? The shovel, cloth-or-something and hammer set would be a great Christmas gift. For a hammer see the BleachBit BlackBerry edition. The Android and iPhone have taken over, so I am not planning to restock the BleachBit BlackBerry edition at this time. Time to retool for iPhone and Android. Ha! Who knew Fox News would cover such a story? Wonder if Hillary thought she could get away with it... https://isum.com + Bleachbit... the perfect combo to hide whatever you're doing. Thanks for the cloth, I already had a couple of other microfiber cloths so I decided to frame yours. It looks great on my bookcase with the autographed card you sent. LightnLar , Thank you for ordering it. I am glad to hear it! Cloth or Something: Order now! Copyright © 2008-2019 Andrew Ziem. Thank you to all contributors. User contributed content, such as forum posts and comments, is copyrighted by the contributors. The BleachBit source code is copyrighted under the GNU General Public License version 3. Unless otherwise noted, the web page content is licensed under the Creative Commons Attribution-Noncommercial-Share Alike 3.0 license and screenshots of BleachBit as public domain. The logo is copyrighted under the GPL. For buying the Cloth or Something see Terms and Conditions.